When we arrived we were greeted with a beautiful Resort that reminded me exactly of a snow chalet! So grand and beautiful. We started the morning with a hot cup of tea looking out over the resort's picturesque golf course, then went down to the 'Golf Shop' to take a tour of the grounds in a golf buggy. SO FUN! We saw some kangaroos and slowly followed the course around with the warm Winter sun shining brightly. We spent the afternoon in Daylesford and tried out some recommendations given to us by the Resort Manager, they were spot on! Later on we headed back to relax at the Resort before dinner. We are currently renovating and don't have the most lovely bathroom right now so when I entered the room and saw a beautiful bath with jacuzzi jets overlooking the grounds, I knew what I was going to be doing!! I soaked in the tub with an espresso coffee while watching a candy-coloured sunset. HEAVEN. Dinner time for us was at the Resort's 'Harvest' restaurant which was filled with guests. We got to enjoy local, award-winning wines, the Hunter Gatherer pinot noir was the biz, and chat with chef Donato who filled us in on the menu. My highlight was the dessert called 'Autumn Forest' which was a chocolate mousse dome with a soft biscuit base, covered in a glossy ganache and pair with a meringue mushroom, gold leaf and vanilla cream. Needless to say, I ate the whole thing and rolled out happily! In the morning, we woke up in a toasty warm room with a crisp cool morning outside. None of the cold came into the room I realised because the Resort has entirely double-glazed windows! Brekky was delivered and I devoured my raisin toast and piping hot long black. After brekky we visited the Resort's spa and enjoyed an hour of total bliss with a whole body massage. Such a dream. Everything during our stay was phenomenal and the staff were some of the best I've ever encountered honestly. Just so friendly and warm. The Resort was modern, so clean (big tick from me!) and oh-so-relaxing. 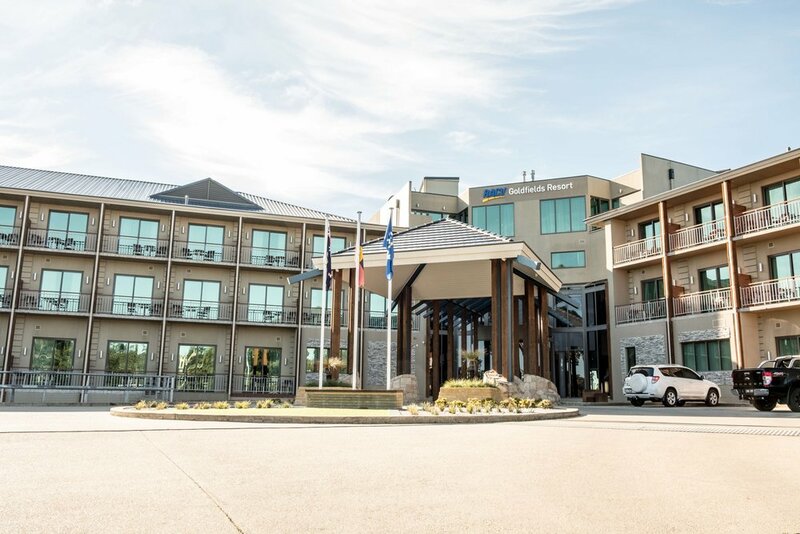 If you're in the market for a getaway this Winter, check out RACV Goldfields and enjoy regional Victoria in warm, relaxing bliss! This post was not sponsored although our stay was complimentary. All opinions are honest and my own.